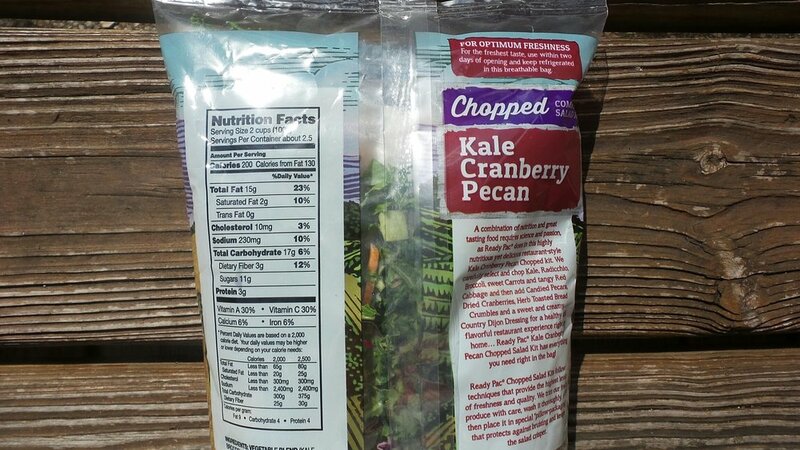 Kale Cranberry Pecan Salad by Ready Pac Foods — I Am Tired of Cooking! This is one of my all time favorite salads. It has such a nice variety of ingredients there truly is a little something for everyone. It contains the oh so popular kale, radicchio, broccoli, carrots, red cabbage, candied pecans, dried cranberries, toasted breadcrumbs and a packet of country dijon dressing. The dijon dressing is a stand out. It is creamy and mild and compliments the variety of veggies in the salad. It will also compliment the addition of your own turkey, chicken or ham if you want to add some more protein. The package contains about 5 cups of salad and the suggested serving size is 2 cups, so that is how they arrive at 2.5 servings. I picked up this package at Walmart for $3.83, but if you were to buy all those ingredients, it would cost more and it would probably go to waste before you could use it all, not to mention the time to wash and chop the veggies and candy the pecans. I am going to add this salad to my Thanksgiving menu because it is presents so well with all the lovely colors and to give those of us who do not care for goopy green bean casserole something else green to enjoy.